Aphria Inc. – The $13 level has developed importance in APH. The lows in February were right around it. Lows are typically more volatile than highs because selling is based on fear while tops are based on hope, and fear is a stronger emotion. $13 was pretty much the exact high in early and mid-May, and early June, and early July. There will probably be resistance there again if it trades higher. There has been support around the $11.30 level since early May. 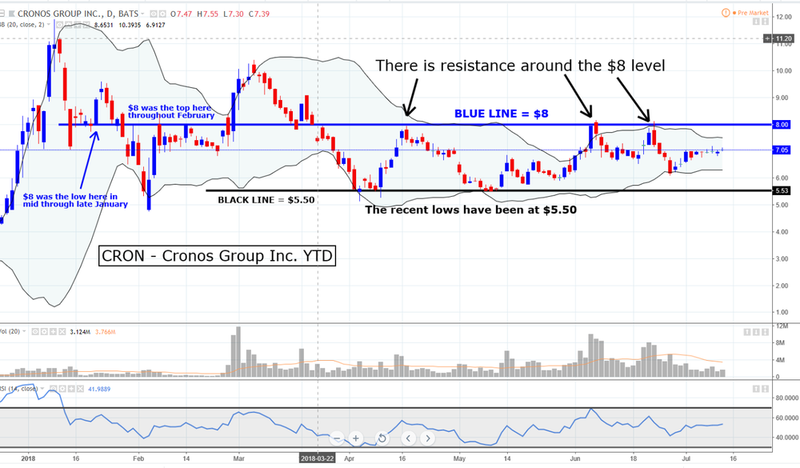 Cronos Group Inc. – The $8 and the $5.50 levels are important in CRON. $8 was the recent high on June 6th and 7th, again on June 21st and 22nd, and it was also the top in April. It was also the low in January and the top in February. The recent lows in April and May have been right around the $5.50 level. These levels will probably continue to be resistance and support. 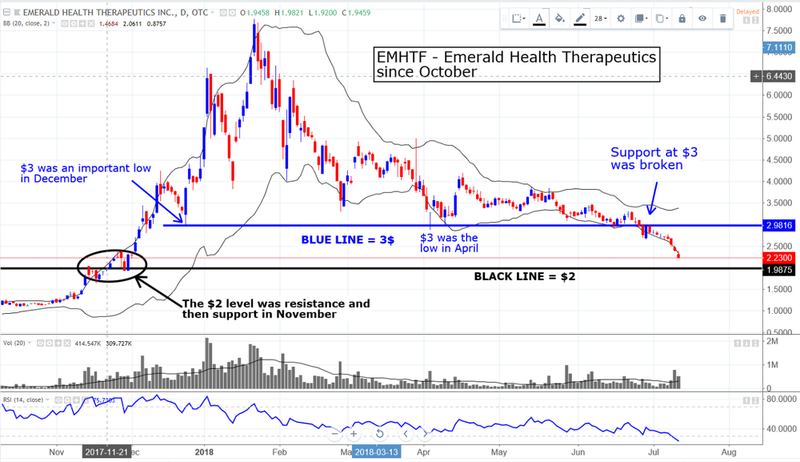 Emerald Health Therapeutics Inc. – EMHTF is in a freefall after breaking support at the $3 level. It is oversold. There may be some support at the $2 level because it was important last November and it is important psychologically. There may be a ‘dead cat’ bounce, but it may be tradable. GW Pharmaceuticals – GWPH found support around the $140 level and has rallied. There is support there because it was the top in January and again throughout the second half of April. It will probably continue to be support going forward. Horizons Marijuana Life Sciences Index ETF – The $15 level has become important resistance in HMLSF. It was the top throughout March. It was also the top on June 7th and again on June 21st. Both times it became overbought and sold off. The recent low was at $13. 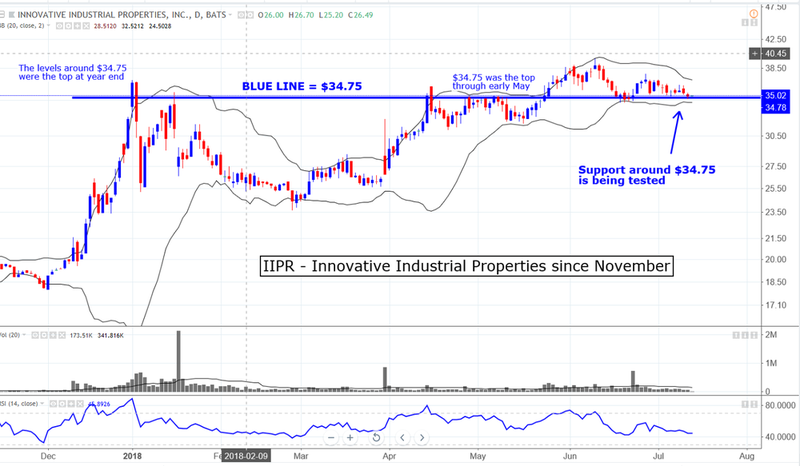 Innovative Industrial Properties, Inc. – IIPR continues to test support around the $34.75 level. If this level breaks it will most likely become a resistance level. There is support here because these levels were the top at yearend and again throughout early May. It has been the low side of the range over the past month. Medreleaf Corp – LEAF recently ran into resistance around $28 – 29. These are the same levels that it found resistance around early in the year. It has broken through and the recent action has been very choppy. Usually that is a bearish sign. Canopy Growth Corporation – The levels around $42 are important resistance for WEED. They were the top in January. They have also been the top since early June. At the end of June the $42 level was broken but it quickly failed after becoming overbought. Is there sufficient liquidity and volume for an institutional investor to acquire a meaningful position? Are there other institutional investors? In other words, is there anyone to buy it from or sell it to? Investment funds that are investing in these securities will need to hire experienced micro and small cap traders (like yours truly) who have expertise with modern trading methodologies in addition to have numerous traditional relationships. Outsourcing and junior traders will not be effective. Trading algorithms and the trade outsourcing business model won’t work with these illiquid securities and the funds will run into liquidity issues around $200-300 mil AUM. These managers should look at a trader as a profit center as opposed to a cost. An experienced trader who has extensive relationships and knows how the markets work will allow a manager to manage more AUM. The Canadian / US Dollar exchange rate needs to be considered, especially if you are going to hold them for the long-term. Obviously, fluctuations in the currencies will affect returns. Many of these equities are Canadian Companies trading on Canadian Exchanges. What is more advantageous to trade? The ADR or on the primary Exchange in Canada? Liquidity needs to be considered. The decision is also influenced by exchange rate calculations and forecasts, and also by investment mandates. For example, an investment fund may only be able to invest domestically, therefore the only option would be the ADR. Important support and resistance levels are starting to develop. It takes time and volume to make a particular price level relevant or important and now that these equities are developing trading histories these levels are forming. Are there reputable brokers involved in the trading of these equities? If so, that's most likely indicative that institutional buyers are investing in these companies and that is probably a Bullish Indicator.